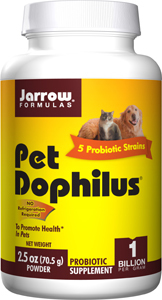 Pet Dophilus® is a probiotic formulation of four species designed specifically for the intestinal health of your pet. Among the dominant intestinal flora of cats and dogs are the Lactobacilli rhamnosus and E. faecium, which comprise 80% of the probiotics in Pet Dophilus. Bifidobacterium Longum and B. Pseudolongum are found in the flora of cats and dogs. Pet Dophilus is in a base of Metabolin®, whey protein, and Vitamin C.
Metabolin provides key metabolites of propionic acid bacteria and nutritionally supports immune function and supports the action of the live lactic acid bacteria in Pet Dophilus. Whey protein is a prebiotic food for the live bacteria.